Maine Sports Media: Maine Red Claws game postponed. Maine Red Claws game postponed. 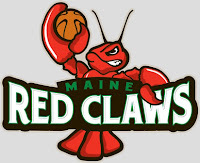 The Maine Red Claws announced postponement of todays game against the Springfield Armor. Springfield had it's flight cancelled due to the weather all over the country. Here is the official announcement. The Maine Red Claws, presented by Quirk Chevrolet, today announced that tonight’s game vs. the Springfield Armor has been postponed due to weather. The Armor were unable to reach Maine after their flight was cancelled due to severe storms in the Midwest; the Armor played last night in Fort Wayne, IN and were due to play the Red Claws at 5 PM today. The Red Claws-Armor game will be rescheduled. Fans with a ticket to today’s game should retain their tickets which will be honored on the rescheduled date.